This image, postmarked 1910, was sent in by a reader. The caption indicates it was the Seventh Church of Christ Scientists, but I can't quite place the building. Does anyone out there recognize it? Thanks, Jeff. I'll swing by there sometime on one of my walks and see what more I can dig up. Hi Eden--are you thinking about St. Thomas of Canterbury? It does have some similar features. St. Thomas was built in 1916 as a Catholic church; the congregation used to meet in the Lakeside Theatre starting in 1915, prior to the church's completion. The Lakeside Theatre is better known today as Alternatives, at 4730 N. Sheridan--the building with the bricolage mural across the front. did you ever figure out the location of the church in the picture? No, I haven't, although a reader sent in a postcard this week which features another view: Edgewater. I grew up on the 5300 N block of Winthrop in the 50's. Behind our building, on the 5300 block of Kenmore, was a very large Christian Science church. It had limestone columns like the ones in the photo. It was torn down in the late 60's or early 70's. We moved to Skokie in 1976. Hi Mike! Jeff posted a link above to the current Seventh Church of Christ Scientists, which is located on the 5300 block of Kenmore and no doubt replaced the original. So that would fit with what you remember from growing up! I currently live on the 5300 block of Winthrop and would like to hear from you about life on the block when you lived on it. Wasn't there a Christian Scientist church located at Hermitage and Sunnyside? That would have been in the 50's. Hi, Jeff is correct. 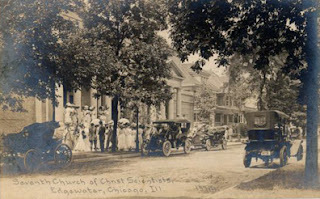 The 7th Church of Christ Scientist was located at 5318 Kenmore, built in 1907-08 and designed by the prolific Solon Beman, who designed nearly forty Christian Science churches across the country, including 1st, 2nd, 4th, 5th, 6th, and 7th in Chicago. It seems like Anonymous is referring to 14th Church of Christ Scientist at Hermitage and Sunnyside.